Since you want to read a theologian who takes serious the discoveries in modern science (both natural and human) and the role of philosophy in theology, Wolfhart Pannenberg is the theologian for you! So you want to read Wolfhart Pannenberg, but you’re not sure where to start. He wrote soooooooo much! I’ve been reading the works of Pannenberg for a while, and I can vouch that his works are dense and, at times, difficult to navigate. So here is my guide to engaging this giant’s work. I will list what I think are the ten most important works of Pannenberg, the order I recommend engaging them, and a brief summary of each. In this small work, Pannenberg discusses his understanding of the Kingdom of God, its futuristic-retroactive nature, and the place it has in theology. Eschatology, that God will establish his Kingdom on earth as it is in heaven at the climax of history, drives theology. It thus takes logical priority in the task of theology. These are more essays by Pannenberg on the relationship of science to Christian theology. The focus of these essays is primarily on the place of the natural sciences in a Christian doctrine of creation. What makes this little volume so interesting is the importance of the Holy Spirit that Pannenberg develops here. This is the monograph that many claim put Pannenberg on the map in the history of theology. He ardently argued that the Christian faith makes or breaks with the historicity of the bodily resurrection of Jesus, and that it is historically demonstrable. This method he called a christology from below and he contrasted it with a christology from above, which he saw in the works of Barth and others. Here, Pannenberg takes a vastly interdisciplinary approach to understanding what it means to be human. Pannenberg affirmed that the core individual human identity was found outside the self, what he termed exocentricity. This exocentricity is grounded in the Son’s relationship to the Father, and is itself the foundation for the imago Dei. It is also what allows individuals to be open to the world. We have finally arrived at Pannenberg’s magnum opus. 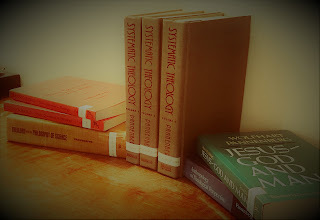 You might be wondering, “If he wrote a systematic theology, then could I not get everything from the above mentioned works here?” In short: No. Following the lead of Barth and others, Pannenberg begins his doctrine of God with the doctrine of the Trinity, preferring a relational model as opposed to the classic. In the second volume, Pannenberg develops his understanding of sin as “misdirected desire” and the consequences of sin, i.e. death, as “alienation.” Volume 3 is dominated by his doctrine of the Church, which he combines with the Work of the Spirit. Of particular interest here, at least for me, is Pannenberg’s semiotic approach to understanding the Church as a sign of the future Kingdom of God. There is simply too much material to unpack in this little paragraph, so you will have to dig into these volumes yourself if you want to learn more! Gunther Wenz, Introduction to Wolfhart Pannenberg’s Systematic Theology (Vandenhoeck & Ruprecht, 2012). — Wenz’s Introduction is great at setting the context for Pannenberg’s work as well does it provide helpful insights into his project. Stanley J. Grenz, Reason for Hope: The Systematic Theology of Wolfhart Pannenberg (Eerdmans, 2005). — Grenz’s Reason for Hope, in my opinion, is the best companion to Pannenberg’s Systematic Theology out there. He provides a chapter on each section of the magnum opus, summarizing its content. Both Wenz and Grenz (hah, I rhymed!) studied under Pannenberg at the University of Munich for their doctorates (D.Theol). Anthony C. Thiselton, Understanding Pannenberg: Landmark Theologian of the Twentieth Century (Cascade Books, 2018). — Thiselton’s companion to Pannenberg is very new and is a great little introduction covering the scope of Pannenberg’s thought! Do not let its small size fool you! So you want to read Wolfhart Pannenberg? Now you know where to start, so get in there! I continue to find Pannenberg’s theology fascinating as I go about my own theologizing, and he’s a very helpful dialogue partner in my research on theological method. He’s dense; he’s difficult; but he’s rewarding.